The “Reply All” button can be a beautiful thing. You can seamlessly deliver information to all your parties with just a single click. 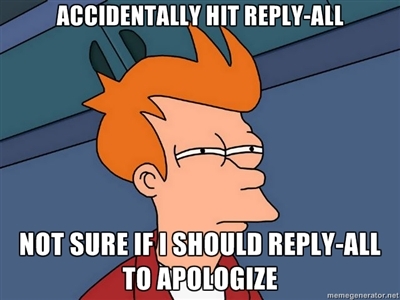 Unfortunately, when that single click should have been on the “Reply” button – not the “Reply All” button – things can get a little sticky. That convenient dream of a shortcut can quickly turn into a nightmare if you accidentally email everyone information intended for just one person. If you use Gmail as a mail server, there is an “Undo” function. (Yes, they really are geniuses over at Google.) Click on “Settings,” then “Labs,” and enable the “Undo Send” option. Every time you send an email, you’ll get a grace period of up to 30 seconds to retract your email if you change your mind. If you use Microsoft Outlook, you have the option to hide the offending button altogether. Press “Alt” and drag the “Reply to All” button all the way off the main toolbar. Voila – problem solved. If you’ve upgraded to Microsoft Office 2010, your instructions are a little more technical. Check them out here. Microsoft also has a nifty plugin option called “NoReplyAll,” in which senders can prevent recipients from Replying All to their messages. To maintain privacy and prevent others from Replying All, try Blind Carbon Copying (BCCing) your email list. That way everyone gets your info, but there are no Reply All situations because there aren’t any visible email addresses. The best advice of all: keep your message short and to the point. No one wants to read a novel-length email before finding out the purpose of the message. Let yours be the least painful of the dozens and dozens of emails to cross someone’s desk that day. Maybe you’ll even be rewarded with a “:)” from a grateful reader.